I decided to make this yesterday to take to work for my lunch. 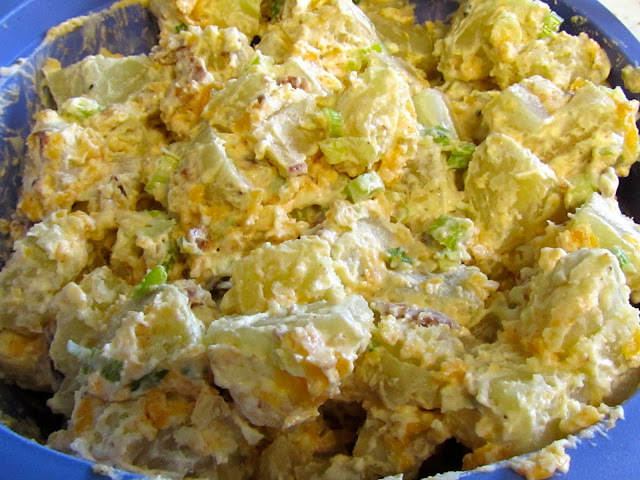 I've never made potato salad before, and this turned out pretty good! I actually liked the taste of it better when I just made it, as opposed to later after it had been in the fridge. But it was still pretty tasty! 1. Boil potatoes until perfectly tender. Drain and allow to cool to warm-- they shouldn't be hot enough to melt the cheese. 2. Peel (if desired-- I like to leave the peel on) and cube potatoes and place in a large serving bowl. Sprinkle with seasoning salt. Mix gently. 3. In a separate bowl whisk together the sour cream, pepper, mayo, garlic salt, and mustard. 4. Add bacon, onion, and cheese to the potatoes. Mix gently. Stir in the dressing mixture. 5. Cover and refrigerate at least 3 hours before serving.